Geert Wilders: Champion of freedom or anti-Islamic provocateur? Both. 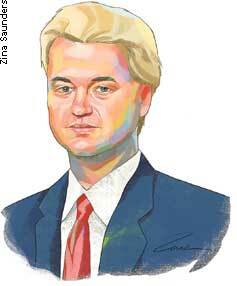 NEW YORK--By his own description, Geert Wilders is not a typical Dutch politician. "We are a country of consensus," he tells me on a recent Saturday morning at his midtown Manhattan hotel. "I hate consensus. I like confrontation. I am not a consensus politician. . . . This is something that is really very un-Dutch." Yet the 45-year-old Mr. Wilders says he is the most famous politician in the Netherlands: "Everybody knows me. . . . There is no other politician--not even the prime minister--who is as well-known. . . . People hate me, or they love me. There's nothing in between. There is no gray area." In March, Mr. Wilders released a short film called "Fitna," a harsh treatment of Islam that begins by interspersing inflammatory Quran passages with newspaper and TV clips depicting threats and acts of violent jihad. The second half of the film, titled "The Netherlands Under the Spell of Islam," warns that Holland's growing Muslim population--which more than doubled between 1990 and 2004, to 944,000, some 5.8% of the populace--poses a threat to the country's traditional liberal values. Under the heading, "The Netherlands in the future?!" it shows brutal images from Muslim countries: men being hanged for homosexuality, a beheaded woman, another woman apparently undergoing genital mutilation. Making such a film, Mr. Wilders knew, was a dangerous act. In November 2004, Theo van Gogh was assassinated on an Amsterdam street in retaliation for directing a film called "Submission" about Islam's treatment of women. The killer, Mohammed Bouyeri, left a letter on van Gogh's body threatening Ayaan Hirsi Ali, the film's writer and narrator. Ms. Hirsi Ali, born in Somalia, had renounced Islam and been elected to the Dutch Parliament, where she was an ally of Mr. Wilders. Both belonged to the center-right People's Party for Freedom and Democracy, known by the Dutch acronym VVD. Both took a hard line on what they saw as an overly accommodationist policy toward the Netherlands' Muslim minority. They argued that radical imams "should be stripped of their nationality," that their mosques should be closed, and that "we should be strong in defending the rights of women," Mr. Wilders tells me. This made them dissenters within the VVD. "We got into trouble every week," Mr. Wilders recalls. "We were like children going to their parents if they did something wrong, because every week they hassled us. . . . We really didn't care what anybody said. If the factional leadership said, 'Well, you cannot go to this TV program,' for us it was an incentive to go, not not to go. So we were a little bit of two mavericks, rebels if you like." Mr. Wilders finally quit the party over its support for opening negotiations to admit Turkey into the European Union. That was in September 2004. "Two months later, Theo van Gogh was killed, and the whole world changed," says Mr. Wilders. He and Ms. Hirsi Ali both went into hiding; he still travels with bodyguards. After a VVD rival threatened to strip Ms. Hirsi Ali's citizenship over misstatements on her 1992 asylum application, she left Parliament and took a fellowship at the American Enterprise Institute in Washington. Mr. Wilders stayed on and formed the Party for Freedom, or PVV. In 2006 it became Parliament's fifth-largest party, with nine seats in the 150-member lower chamber. Having his own party liberates Mr. Wilders to speak his mind. As he sees it, the West suffers from an excess of toleration for those who do not share its tradition of tolerance. "We believe that--'we' means the political elite--that all cultures are equal," he says. "I believe this is the biggest disease today facing Europe. . . . We should wake up and tell ourselves: You're not a xenophobe, you're not a racist, you're not a crazy guy if you say, 'My culture is better than yours.' A culture based on Christianity, Judaism, humanism is better. Look at how we treat women, look at how we treat apostates, look at how we go with the separation of church and state. I can give you 500 examples why our culture is better." He acknowledges that "the majority of Muslims in Europe and America are not terrorists or violent people." But he says "it really doesn't matter that much, because if you don't define your own culture as the best, dominant one, and you allow through immigration people from those countries to come in, at the end of the day you will lose your own identity and your own culture, and your society will change. And our freedom will change--all the freedoms we have will change." The murder of van Gogh lends credence to this warning, as does the Muhammad cartoon controversy of 2005 in Denmark. As for "Fitna," it has not occasioned a violent response, but its foes have made efforts to suppress it. A Dutch Muslim organization went to court seeking to enjoin its release on the ground that, in Mr. Wilders's words, "it's not in the interest of Dutch security." The plaintiffs also charged Mr. Wilders with blasphemy and inciting hatred. Mr. Wilders thought the argument frivolous, but decided to pre-empt it: "The day before the verdict, I broadcasted ['Fitna'] . . . not because I was not confident in the outcome, but I thought: I'm not taking any chance, I'm doing it. And it was legal, because there was not a verdict yet." The judge held that the national-security claim was moot and ruled in Mr. Wilders's favor on the issues of blasphemy and incitement. An organization called The Netherlands Shows Its Colors filed a criminal complaint against Mr. Wilders for "inciting hatred." In June, Dutch prosecutors declined to pursue the charge, saying in a statement: "That comments are hurtful and offensive for a large number of Muslims does not mean that they are punishable." The group is appealing the prosecutors' decision. In July, a Jordanian prosecutor, acting on a complaint from a pressure group there, charged Mr. Wilders with blasphemy and other crimes. The Netherlands has no extradition treaty with Jordan, but Mr. Wilders worries--and the head of the group that filed the complaint has boasted--that the indictment could restrict his ability to travel. Mr. Wilders says he does not visit a foreign country without receiving an assurance that he will not be arrested and extradited. "The principle is not me--it's not about Geert Wilders," he says. "If you look at the press and the rest of the political elite in the Netherlands, nobody cares. Nobody gives a damn. This is the worst thing, maybe. . . . A nondemocratic country cannot use the international or domestic legal system to silence you. . . . If this starts, we can get rid of all parliaments, and we should close down every newspaper, and we should shut up and all pray to Mecca five times a day." It is difficult to fault Mr. Wilders's impassioned defense of free speech. And although the efforts to silence him via legal harassment have proved far from successful, he rightly points out that they could have a chilling effect, deterring others from speaking out. Mr. Wilders's views on Islam, though, are problematic. Since 9/11, American political leaders have struggled with the question of how to describe the ideology of the enemy without making enemies of the world's billion or so Muslims. The various terms they have tried-- "Islamic extremism," "Islamism," "Islamofascism"--have fallen short of both clarity and melioration. Melioration is not Mr. Wilders's highest priority, and to him the truth couldn't be clearer: The problem is Islam itself. "I see Islam more as an ideology than as a religion," he explains. His own view of Islam is a fundamentalist one: "According to the Quran, there are no moderate Muslims. It's not Geert Wilders who's saying that, it's the Quran . . . saying that. It's many imams in the world who decide that. It's the people themselves who speak about it and talk about the terrible things--the genital mutilation, the honor killings. This is all not Geert Wilders, but those imams themselves who say this is the best way of Islam." His idea of how to do so, however, seems unlikely to win many converts: "You have to give up this stupid, fascist book"--the Quran. "This is what you have to do. You have to give up that book."